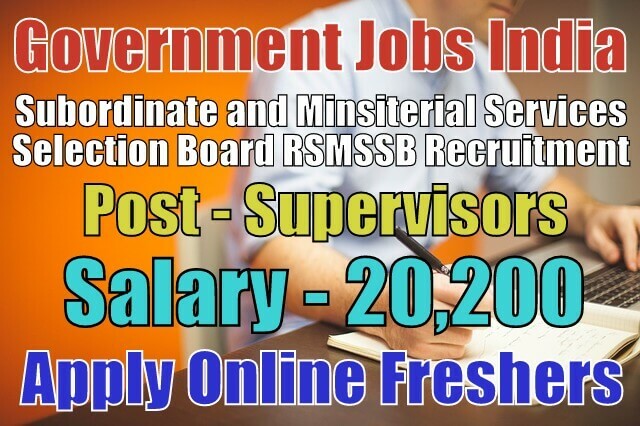 Rajasthan Subordinate and Ministerial Services Selection Board RSMSSB Recruitment 2018-19 (Ministry of Health and Family Welfare, Government jobs in India) notification for 1832 supervisor posts. All legible and interested candidates can apply on or before (03-08-2018). 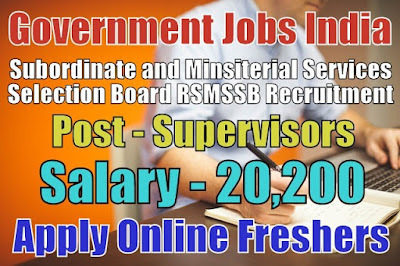 Further information about the Rajasthan Subordinate and Ministerial Services Selection Board recruitment online registration and exams, vacancies, RSMSSB login and jobs list, result, salary details, careers, admit card, application fee, online form, hall tickets, RSMSSB upcoming government jobs in India, educational qualifications, experience and all other details/information about this post is mentioned in details below. The total number of vacancies are 1832. Salary/Pay and Grade Pay - For supervisor posts, the payable salary will be Rs 5,200 - 20,200 with Rs 2,800 grade pay per month. Further information about salary details is mentioned in the detailed advertisement.